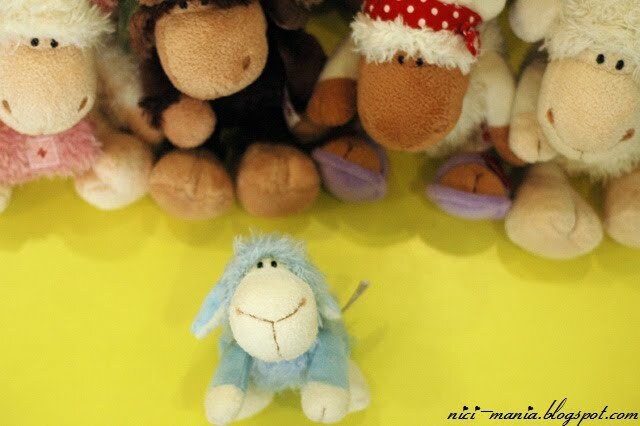 A blue Jolly Mah (Jolly Mäh) appears in NICI-Mania and other Jolly Mah sheep curiously gathers around to see this peculiar looking blue color Jolly Mah. 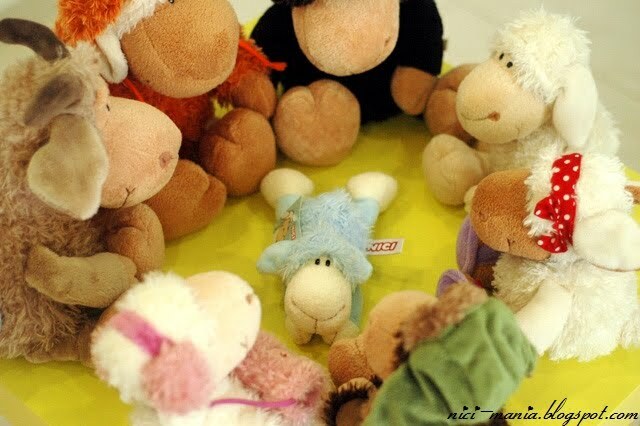 No one at NICI-Mania had seen this blue Jolly Mah sheep before as it is an extremely rare breed. Much to our surprise, there were 2 blue Jolly Mäh where we found it. The even bigger surprise is, out of the 2 blue Jolly Mah, one of which has a cute round face with eager eyes saying "Please bring me home". You are looking at him now, he is the one NICI-mania brought home. Flying blue Jolly Mah! Jolly Mäh is already super happy to have finally found a home as they have been around in the market at least 3 years ago. 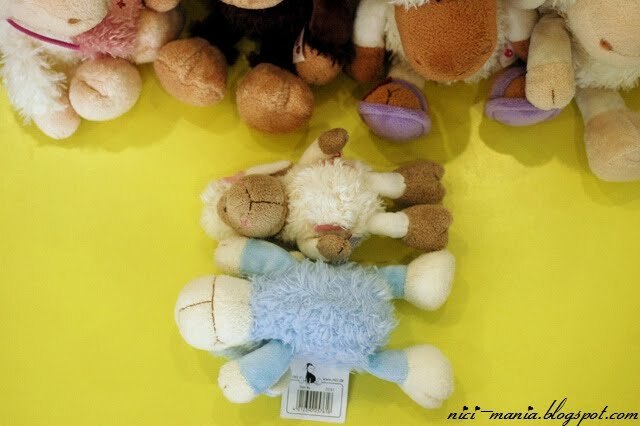 That was the time where the NICI retailers in Singapore have a whole lot of Jolly Mah sitting and lying in all kinds of colors - white, black, blue, pink, grey. All of which were sold out pretty fast and never got restocked. It was a rainbow array of colors back then. If you're searching for a blue Jolly Mah sitting plush, its almost impossible now unless you look for those fake ones from China. 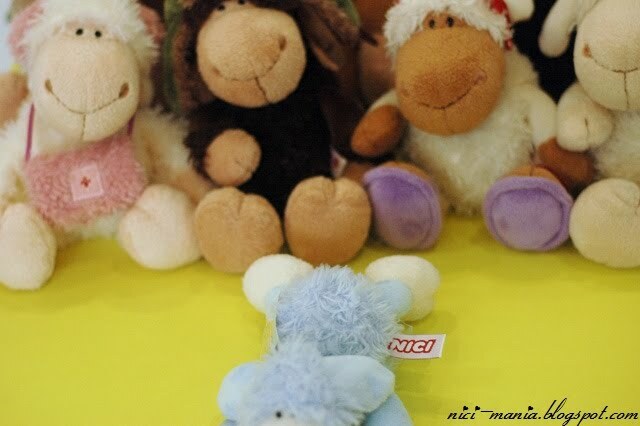 NICI-Mania was originally not a big fan of lying nici plüsch but this blue Jolly Mäh pretty much captured our heart. 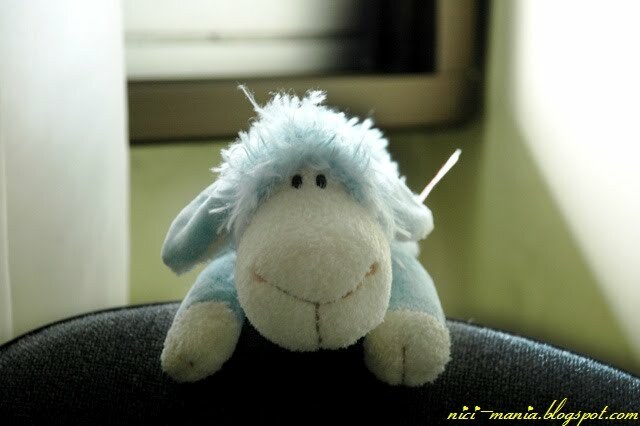 See, blue Jolly Mäh can be a sitting nici plüsch too! Look at how cute the way he sits. The classic blue Jolly Mäh tag. This is the only one we have still in good condition. Our previous classic Jolly Mah tags are all crumpled and messed up because we did not cut it off and keep it nicely. 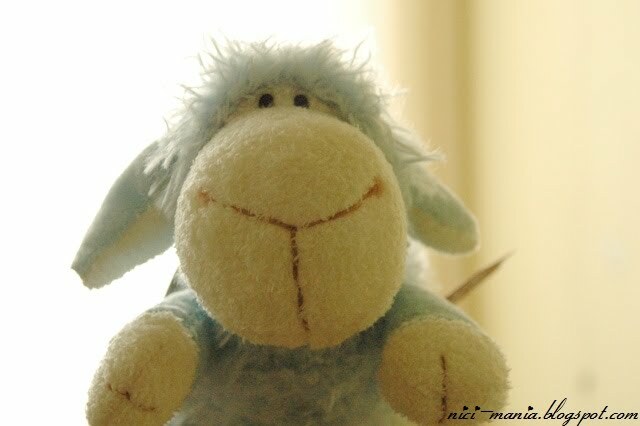 This lying blue nici Jolly Mäh is 15cm but look how much bigger it is than the normal sitting 15cm Jolly Mäh plüsch. The face of blue Jolly Mah is clearly much bigger. Jolly Rosa: Why are you using me as reference?! 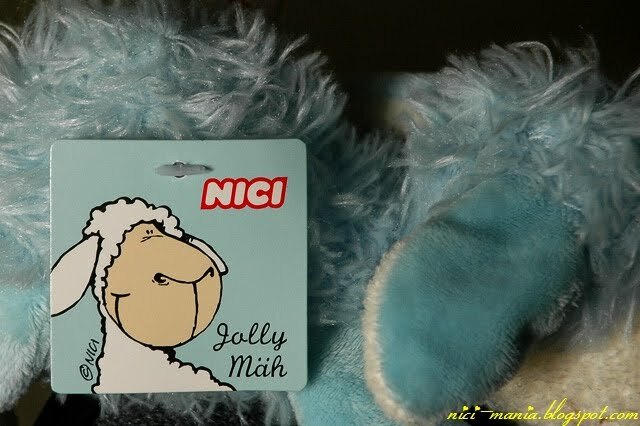 Jomo the brown Jolly Mah and blue Jolly Mah are now the only 2 really rare nici plüsch here at NICI-Mania. 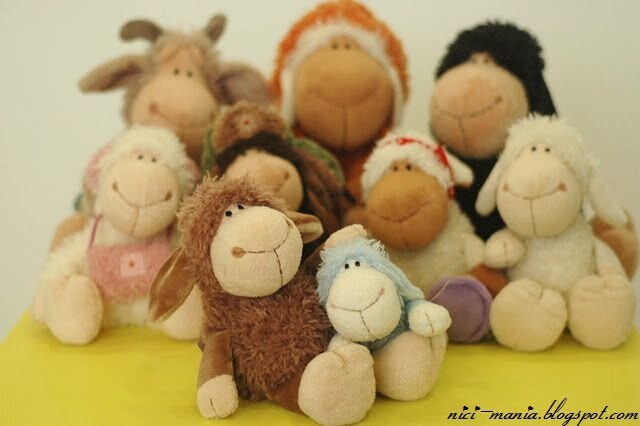 25cm sitting Jolly Jomo was found in Malaysia NICI shop which was also a huge surprise for us. 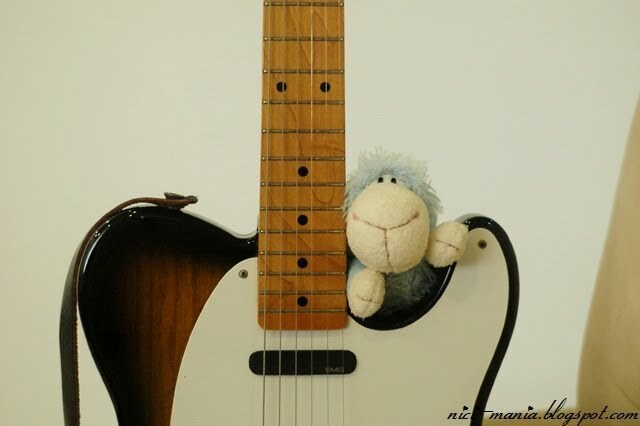 Blue Jolly Mah poses with a Telecaster. 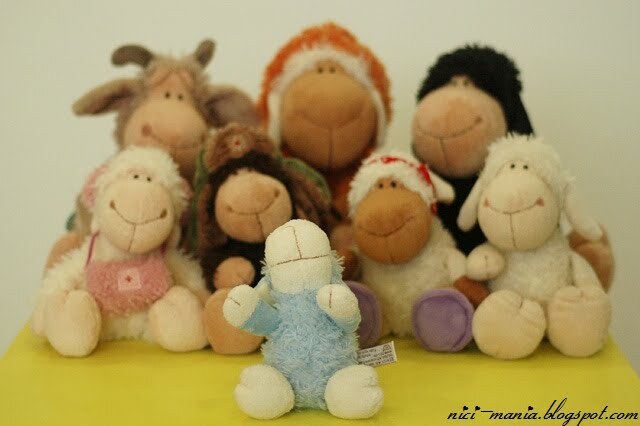 Because of his unique color, other Jolly Mah nici plüsch seems to be a little jealous of him. Our next mission, we hope to find a grey sitting Jolly Mah somewhere. If we can't find one, we would probably get one of the many lying grey Jolly Mah in Singapore. As we mentioned earlier, there is one last blue jolly mah left, hurry down to Raffles City CNS to get it before its gone. Update: This post is about one month belated after we got this jolly mah, but the last one could still be there as it is not that popular. 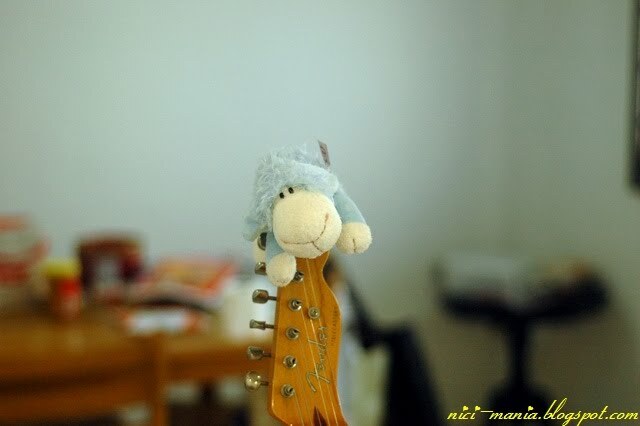 It also took us for about more than a month before we eventually decided to buy this blue sheep from the shop. She is a pretty sheep! I could find a pink Jolly Mäh two years ago, now it is impossible! Again a story that puts a smile on my face. 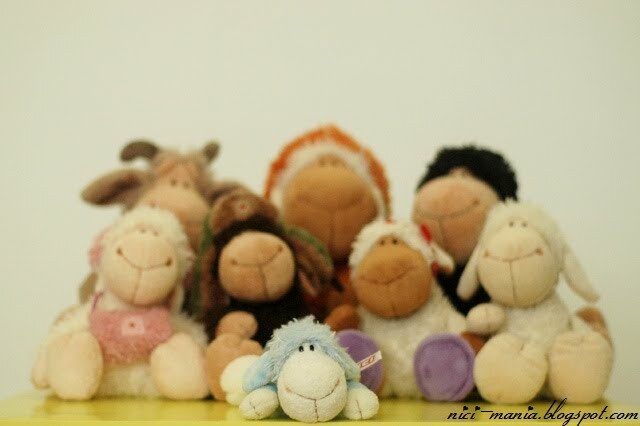 You do have a rare sheep there.. Also Jolly Brown is a indeed joy to have, I've searched for one myself for a long long time..
hihi! Can i ask you how do you wash your jollys? will their "fur" clump up when they are soaked in water?